Join Us!!! We are looking for someone to help us cover CBA basketball. Please send us an e-mail. Eurobasket had the pleasure of chatting with experienced international coach Ozell Wells , who just signed with BC Kalev-Rapla, as the FIRST EVER U.S. Coach in Estonia. Eurobasket: Hello coach, it looks as if you are making history again! What are yo hoping to accomplish? You are the 1st ever US coach there, is that significant? OW: Hello, good to speak with u. This job is more of a thing where I have a chance to TEACH THE GAME of basketball. When I say teach the game, I am speaking in terms of fundamental aspects that are sorely lacking.. Even in Europe, the influence of streetball, ESPN highlights, etc. have affected the level of play. My aim is only to help players reach their FULL POTENTIAL! I guess the importance is that I can carry the US name and build on its reputation while paving the way for other coaches to follow suit. Eurobasket: Now you had a good situation in Luxembourg this past year, coaching the jr national teams. Was that not the IDEAL OPPORTUNITY to teach the game? OW: Actually YES IT WAS. However with the structure of basketball and sport in general, in countries where it is viewed only as recreation & not a profession dimishes things. That approach to the game dictates that there can never be a total dedication to realizing ones' full potential, as players who desire to be great, hit a ceiling; and as such, are forced to go elsewhere to hone their talents. I relished the chance to work with some GREAT COACHES who have a similar desire to TEACH THE GAME, Mathias Fischer, Yves Grandjean, Mathias Eckhoff, Ron Tuffel & Walt Lilyblad. Eurobasket: What about the US? Why not set up shop there, teach the game there the way it is supposed to be in your mind? OW: There are many coaches in the US who have adopted a similar appraoch to myself & are teaching ACTUAL BASKETBALL Tom Hughes, Ken Sanders, Jamie Angeli, Ramsey Nichols, Durand Walker and many others. The state of affairs in the US has been gradually deteriorating, as players are being more or less wharehoused & sold to the highest bidder based on height, athletic ability, etc but are not taught the basics.The commericalism of sport in the US has been a big detractor. Also there, the NBA highlights, AND 1 mix tapes, and fascination with “crowd pleasing” “STAR POWER” is a turn off. Eurobasket: There is talk of an International Basketball Academy in Estonia, correct? OW: Yes, it is the brainchild of longtime int'l coach Maarten vanGent and with support from BC Kalev mgmt, it is taking shape. I am honored to be a part of it coming to realisation. There will be talents from the world over HERE in Tallinn! Eurobasket: You were the youngest FIBA coach ever in '00 in Saudi Arabia, do u ever see yourself trying to advance to a higher level, say the NBA or a Euroleague team? OW: The NBA and Euroleague are everyone's dream and I value the relationshsips that I have now with people at those levels. With my aim being to develop players, if something where to materialize, I would love to explore the oportunuty. Eurobasket: How do u see the Kalev-Rapla team? Any players stand out in your mind? One month after the 2018 Central Basketball Association season concluded its sixth season, the Antigua and Barbuda Basketball Association completed its 50th season. And in the golden jubilee season that started the first year of partnership between the CBA and the ABBA, it resulted in a massive success for all parties involved. Baltimore's Torey Fassett (6'6''-F), who led his Flyers club to a 3-0 sweep last night in the 2018 ABBA Finals, was named Most Valuable Player for the league with his dominating play throughout the season. 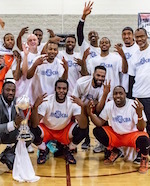 Fassett, who scored 21 points in the final game, scored critical field goals for his club during the 6-month campaign, not only leading his team to a 13-4 regular season record and 2-seed in the playoffs, but their first championship title since 2014. 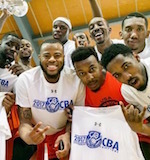 The 6-foor-7 forward, who played collegiate basketball at Saint Mary's University in Canada and with the Baltimore Shuckers during the 2017 CBA season, Fassett finished in the top-10 of the ABBA season in most statistical categories: 2nd in total points (521), 7th in rebounds (203), 1st in steals (74), and 8th in blocks (18). He also finished 3rd in points per game (22.7), 1st in steals per game (3.2), 1st in 2-point field goals (169), and 6th in 3-point field goals (35). The season was also a success for the other CBA players participating in this pilot project in the Caribbean, as Baltimore's Jermaine Bolden led his Oval Ojays squad to the regular season championship and top-seed with a 15-2 record. Bolden led the league in total assists (128), assists per game (5.1), as well as finishing 4th in total steals (62) and 9th in steals per game (2.5). The third member of the Baltimore roster that played in Antigua, 6-foot-7 forward Benny Iko, also had a successful season in his first year of playing overseas, leading his first-year Steelers team to a 11-6 record and the 4th-seed in the playoffs, where he finished 2nd in total rebounds (294), 2nd in blocked shots (45), 7th in total points (366), and 10th in total steals (43). Iko's Steelers teammate, Joshua Minner, who played in the CBA in 2015 and played for one year in 2016 in Brazil as part of the CBA Global Opportunities Program in South America, also dominated play this year, as he finished the league 1st in total points (568), 2nd in points per game (24.7), 2nd in 2-point field goals (168), 4th in 3-point field goals (42), 6th in total rebounds (204), 7th in total assists (71), 6th in total steals (49), and 9th in total blocks (17). The 2018 CBA partnership with Antigua has been deemed a success by the league's Caribbean partners, and brought attention and notoriety to the sport of basketball in the region that had not been witnessed in a long time. The local players within Antigua gained valuable experience playing alongside the seven CBA players, which will help them as the national team heads to Suriname next week to participate in the 2018 FIBA Championships. The Antigua national team will be led by Illinois Coal Miners' head coach and general manager, John Spezia, where not only CBA players, but CBA coaches have received opportunities to boost basketball in the Caribbean as part of this partnership. Fort Wayne Flite clinched CBA title. They topped Indianapolis Blaze in double-overtime thriller to secure the third consecutive trophy. The Flite grabbed a 23:14 lead after the opening period. But Blaze bounced back in the next two quarters. Indianapolis erased the deficit and surged ahead to take a 3-point lead before the fourth frame. But the Flite managed to rescue the game forcing overtime. They needed two extra periods to run away with the victory. (1) INDIANAPOLIS 98, (4) MEMPHIS 80: (Fort Wayne, Ind.) - In their first meeting with each other in league history, Indianapolis and Memphis put together a competitive playoff game early on in the first semifinal game of the 2018 CBA Postseason Tournament. It appeared Indianapolis, who finished the regular season with an undefeated record, recieved a brief scare as Memphis jumped out to an early advantage, leading by as many as eight points in the first quarter. But those that have been following the back-to-back regular season champions were fully aware that Indianapolis has not had good opening periods all season, trailing in six out of the eight regular season games through the first frame of the game. It was much of the same script against Memphis last night, as despite the early deficit, Indianapolis regained the lead in the second quarter and blew upon the game in the second half to earn their second consecutive championship berth. Although Memphis' Jameel Best earned his ninth double-double of the season, Indianapolis' William McClure's unofficial nine blocks in the contest stifled Memphis offensively in the paint, forcing Memphis to unsuccessfully shoot from the outside, where they shot a league-worst 26.9% from the three-point line during the regular season. Indianapolis, who is seeking their first championship title Sunday afternoon, had five players in double-digits, led by Tyler Bibbs (6'6''-F-93, college: St.Francis, IN) (17 points) and Anthony White (6'3''-G-92, college: Mercer), Jr. (15 points), while Memphis (5-4) were led by Best with 27 points. (3) FORT WAYNE 94, (2) MIDDLE TENNESSEE 86: (Fort Wayne, Ind.) - In the 2014 CBA Postseason Tournament, the two teams met in Nashville and competed in a thrilling double-overtime semifinal game with Middle Tennessee prevailing, and ultimately winning their first league title against St. Louis in the finals. Two years later in the 2016 CBA Postseason Tournament, Fort Wayne, on their home court, knocked off Middle Tennessee by 27 points in the championship game, to not only have the largest margin of victory in a league playoff contest, but also earning them their first championship title and becoming the first team to finish the season with an undefeated record. The third playoff contest between the two teams last night appeared headed towards a repeat of the 2016 title game, as a back-and-forth first half turned into a third-quarter rout, as Fort Wayne led by as many as 17 points. But Middle Tennessee put together a sensational rally in the final quarter, to not only erase the double-digit deficit and stun the crowd, but taking their first lead at 86-85 with five minutes to play. But with a shorthanded roster, the second-seeded team from Nashville ran out of gas, as Fort Wayne used a 9-0 run in the final five minutes of the matchup, to pull away and clinch a spot in the CBA championship game for a league-record fourth consecutive year. Fort Wayne, who will look to earn their third straight league title Sunday afternoon, had five players in double-digits, including Terrance Beasley with 21 points and Antonio Cannon (6'0''-PG-92, college: Indiana Tech) with 19 points. Middle Tennessee, which fell to 1-4 against Fort Wayne on the road, were led by Myles Thrash (6'0''-PG-77, college: Stillman) (25 points), Joshua Sain (22 points) and Torye Pelham (6'6''-F-87, college: S.Mississippi) (20 points).